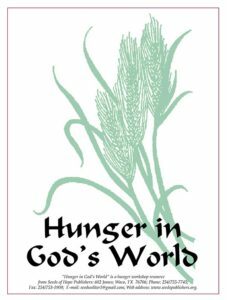 Hunger in God's World is a four-part workshop curriculum that has been developed for churches over the years. For a pdf version of the curriculum, click here. If you have problems with this or any other pdf, contact seedseditor1@gmail.com. 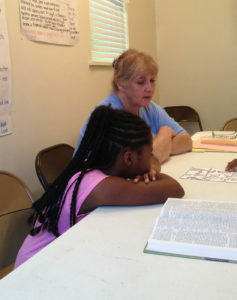 The curriculum, created primarily for church groups, consists of four sessions. The first session is called “Who Is Hungry and Why?” and teaches participants about hunger around the world through group exercises. The second, “Hunger Has a Face,” introduces personal stories of hungry people and the realities they face. “What Does God Want from Me?” explores, in the third session, biblical teachings about caring for poor and marginalized people. “What Can One Person Do?” includes, in the final session, definite steps that churches and individuals can take in responding to the needs of hungry people. HIGW has been presented to youth groups, confirmation classes, seminary classes and adult study groups. Through a partnership with Caritas of Waco, the Seeds staff trained Linda Yoon, a student in the Baylor University School of Social Work, to conduct the workshop. Among other uses of the curriculum, Yoon translated it into Korean and presented it a children's group. 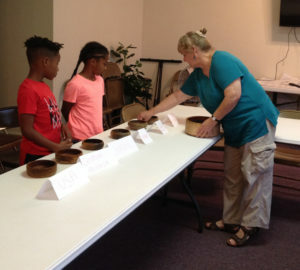 Several years ago, however, Conway Del Conti, Hunger Coordinator for the Waco Regional Baptist Association (WRBA) in Waco, TX, paired the workshop with the innovative “Cooking Matters” program from "No Kid Hungry" to help women in a housing development find ways to overcome hunger and create community in their neighborhood. Cooking Matters, founded in 1993 as part of Share Our Strength’s “No Kid Hungry” campaign, teaches participants to shop smarter, use nutrition information and prepare delicious meals that are affordable even on a SNAP (Food Stamp) budget. Volunteer instructors from Cooking Matters have helped thousands of low-income families across the country learn how to eat better for less. 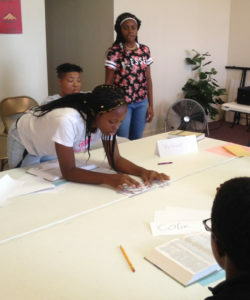 The pilot for the program began at Waco’s Kate Ross Housing area during the summer of 2014 and was repeated in 2015, with instructors from Acts Church, a church in the Kate Ross neighborhood. Del Conte said her goal was to teach the class more about food insecurity—theirs and that of others around the world. Before Del Conte took the workshop to Kate Ross, it had always been offered in churches and agency settings, and most of the participants had been at least somewhat affluent. But the women who attended Del Conte’s classes didn’t have to use their imaginations to understand how hunger feels. Nevertheless, they were eager to learn about food insecurity in other parts of the world. As a result of their studies, they formed a community of their own, working together to come up with ways to help each other. The WRBA then printed the curriculum and the Seeds staff trained consultants to take the workshop, along with cooking classes, to churches in the area. In 2018, Alexis Weaver of the Atlanta Food Bank employed HIGW for a training there. Most recently, the Seeds staff presented the workshop to the youth and children of Greater Bosqueville Baptist Church in Bosqueville, TX. Below are photos from the two Saturday morning sessions. Photos are by Syeeda Echols, minister to youth and children at GBBC. Hunger in God's World, Part 1: Who's Got the Food? Hunger in God's World Part 2: Where Are People Hungry? Hunger in God's World, Part 3: What Does God Want from Me? Hunger in God's World Part 4: What Can One Person Do?